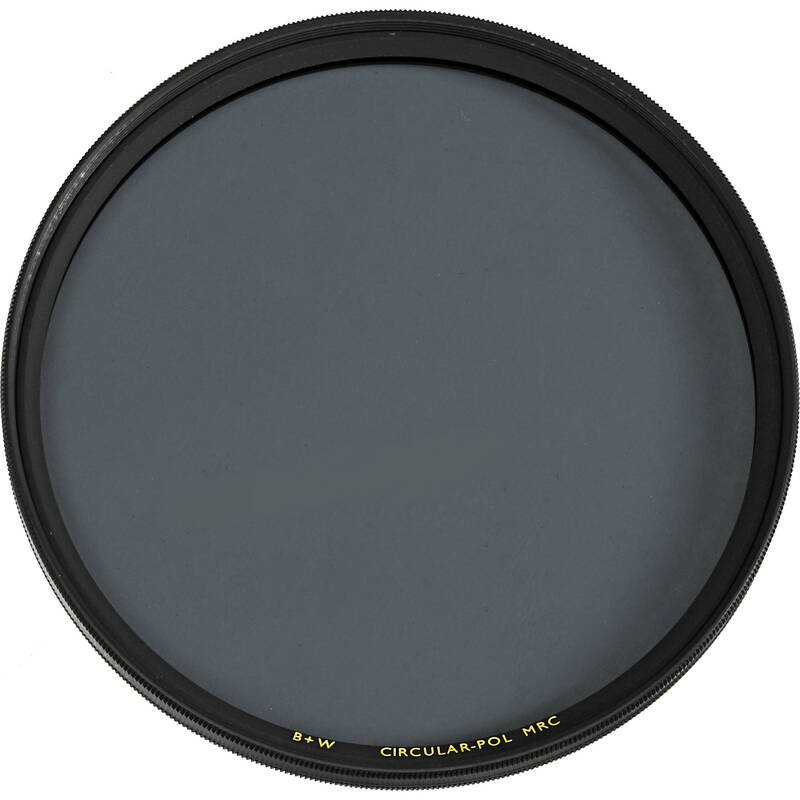 The B+W 72mm Circular Polarizer MRC Filter helps to reduce reflections and glare by filtering out light that has become polarized due to reflection from a non-metallic surface. The light from the sun naturally becomes partially polarized due to reflecting off electrons in air molecules, causing the light to scatter into what appears as haze. A polarizing filter arranges, and filters, this directionally polarized light perpendicularly to the reflected light, allowing for the absorption of much of this light. This results in a noticeable reduction of glare and reflections from non-metallic surfaces and an increase in the saturation of skies and foliage. 72mm Circular Polarizer MRC Filter is rated 4.8 out of 5 by 90. Rated 3 out of 5 by Anonymous from Does the job but has some minor issues What's good: Overall the quality is fine and the filter works fine Firm mount, yes - once it is on the lens. What's not: 1. I have a difficult time mounting this filter into some of my lenses. 2. Lens caps have an interesting way of popping off the lens when this filter is attached. I have other B+W filters but none with this problem. Undecided: these filters are heavier then most I've used and the glass seems much thicker. Benefit? I've left off whether I'd recommend to a friend. You'll do fine with these, but you'll also do fine with Hoya, which I normally use. Rated 5 out of 5 by Dean G. from Top Notch Filter This was purchased as a gift for my daughter's 18-200 Nikkor lens. I own a few of these myself for my 77mm lenses. Build quality is excellent, the brass ring doesn't stick and become difficult to remove as the lesser quality anodized aluminum rings do. Brass isn't as sensitive to temperature changes as aluminum, and therefore doesn't bind when trying to remove them after use or when swapping filters for effect in the field. Easy to use, a must for an outdoor / landscape photographer. Greatly reduces flare on hard surfaces, plants and water. Will bring out detail in sky and clouds you couldn't get without it. Rotate the ring at 90 degrees to the sun, and you'll be amazed at the difference it makes in your images. Almost always on my lenses, I only take them off when shooting at night. Sure, they are a bit costly. But the truth being, your image is only as good as your weakest link. Unfortunately, I learned this the hard way. The only filters I now own are B+W, Heliopan, and Singh-Ray. Why would you spend your hard earned money on a good lens, and buy a cheap filter? Your optics are your greatest asset to good quality images, and not the place to try and save a buck. Buy it. You won't be disappointed in the quality. Rated 4 out of 5 by Timothy M. from Nice filter - gets the job done I am using his on my Canon EF 28-135mm F/3.5 - 5.6 IS USM lens. The image is clear and the polarization is effective but it does vignette a little at the wide angle end of the zoom. I shout have got the thin version. Rated 5 out of 5 by PhoJon from Impressive quality I have read that brass ring filters are much less likely to bind in the camera filter threads than the more standard aluminum ring filters. So I selected this filter based on that fact, the B + W name, and the advertised rugged build of the filter. I must admit I was inluenced also by the many good reviews. In my so-far limited use, I am impressed by the filter's performance and ruggedness. The rotating ring is smooth and well damped. The blue skies and white clouds are impressive. Although pricier than lesser polarizers, I consider it a worthwhile investment. Rated 5 out of 5 by Adamphotoman from It is false economy to buy a CHEAP Polar I photograph artwork for a living. I need to see with absolute clarity and this filter helps me do just that. Shiny oil paintings are rendered with exact colour and sharpness.A cheaply made polar filter which will not be multicoated will not retain all the detail. This filter does! This filter is threaded on both sides and it allows me to add a lens hood to the polarizer. Since the lens hood is substantial there is a little wobble to the rig, however it does not affect the performance. Rated 5 out of 5 by joe schmoe from Good polarizer So far, so good. I'm recently used this during a trip to New Mexico on my Nikon 28mm 3.5 PC lens (mostly when unshifted.) No noticable vingetting, solid construction, and a quality feel. However, it's not quite as extreme in its effect when compared to my Hoya HD CPL. My subjective experience is that the Hoya increases saturation/cuts reflection a bit more. One thing I can't really comment on is how easy it is to clean, look to other reviews for that information. Rated 5 out of 5 by GordonB from Well built filter B+W makes a well designed filter, better than Tiffewn and Hoya. This model was returned as it causes vignetting at 17mm with a crop sensor camera, purchased the 'slim design' to replace it. Rated 5 out of 5 by Calson from worth the extra cost Putting a filter on an expensive lens adds some measure of protection but also introduces more surfaces to cause problems with flare and ghosting so as a rule I avoid using filters. With a polarizing filter the goal is improved image quality so it is worth the extra cost to get a coated polarizer to minimize the potential problems introduced with this extra piece of glass. The thick version makes it easy to use a Nikon lens cap with the filter left in place which is more convenient. As this filter will be used with a 105mm lens there is no need for a thin filter that would need to be removed to use a lens cap. The thicker lens also allows for screwing on an additional filter such as a ND filter to reduce the light reaching the sensor by 4 stops or more which enables the use of much slower shutter speeds. What is the possibility of vignetting with this lens if I use a Sony A 20mm wide angle lens? Asked by: Wen Qiang D.
i bought this filter to use with a Tamron 17-50mm zoom. It works very well and I have not seen any vignetting, even at 17 mm. When this filter do well with a 18-200 mm telephoto lens? That is exactly the lens I have mine on and I have good results at both ends of the focal length. Can I screw an additional filter on top of this filter? I've never tried. It looks like it has threads so you might be able to. I think a better option would be to put the polarizer on last to allow easier access for the ring to turn. You also have to be mindful you may get vignetting with more than one filter. Especially with wide-angle. Answered by: ROBERT C V.
With this filter on, how many stops of light will I lose? This B+W Polarizer MRC can DECREASE up to 1.5 f-stop. I am using it with good results on an A 7RII; both the 16-35 and the 24-70. Is it best to remove my UV filter when using this filter? Sometimes stacked filters cause vignetting, in which case absolutely take it off, but for most people there is no practical difference. As stated elsewhere the UV feature is essentially useless on digital cameras and the only real purpose is to protect the front glass (and threads) from physical damage and grime. The CPL performs that function equally well, albeit at a higher price. As a general comment about the value of protection filters, improper lens cleaning or repeated cleaning over many years can cause micro scratches on the front element coating which are nearly invisible, but which will literally destroy bokeh by adding lines inside the blurred elements. A replaceable UV filter takes that wear, and may also be hydrophobic or otherwise easier to clean than the lens glass. If UV filters were invisible it would be obvious to always leave one on. But they aren't and they create a variety of impacts on image quality, sometimes even messing up auto focus function. So it's a trade off between your desire for equipment protection and image perfection. The photo world seems split 50/50 on this question. Many people would probably call this idea nuts but if you subscribe to the protection logic the UV filter could also protect your more expensive CPL and in certain conditions it actually might make sense to put it on the outside of the CPL. I'm in the middle of this argument. I have a UV (or similar) filter on every lens entirely for protection. Unless time is critical I generally take it off when I put the CPL on, and I take everything off when seeking highest image quality with my sharpest lenses. Can I screw an additional filter on this CPL? Yes. It has front threads to accept an additional 72mm filter. How difficult is this filter to clean? I have read horror stories about other brands and the difficulty in cleaning them. I think a lot of the answer lies with ones interpretation of what clean is. I have used a variety of filters by a number of different manufacturers over many years and I do not find this filter to be more difficult to clean. I miss the old Kodak 50 pack of single use tissues. I chose this brand, B+W, based on their reputation for quality and am very satisfied.